The film’s musical score is based on the Scottish folk song “My Bonnie Lies over the Ocean.” This song has become the theme for the film. The original lyrics of the lament represent the European immigrants who came to Tod Inlet. A modern composition by a young Scottish composer, Jennifer Austin, who was inspired by the original, introduces the film. Several instrumental and sung versions of the ballad also occur during the film. The group Gatlicha, especially composer and lead vocalist Kuljit Sodhi, has prepared a special Sikh version of the “bonnie” music, as well as other Indian/Sikh music for the film. Other music using Chinese instruments, especially the erhu, complement the multicultural nature of the film. It’s nothing but concrete for me. 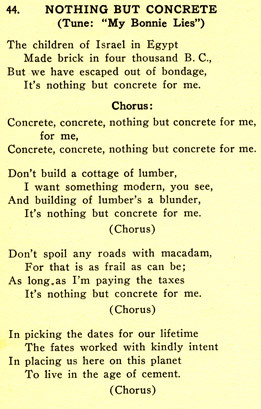 Concrete, concrete, nothing but concrete for me. To live in the age of cement.